Inquirers class "Orthodoxy 101" is offered in the Fall and the Spring. This is an excellent opportunity to learn more, without any pressure to join! If you have any questions, please do not hesitate to ask: email our pastor, Fr. Stephen. He and our entire parish family would be delighted to meet with or speak to you personally. If you are looking for something regarding the Orthodox faith, its practices and/or its teachings, and don’t find it on our webpage, please don’t hesitate to email and ask. Please enjoy a selection of YouTube Videos below, take some notes, and contact our pastor email if you'd like to discuss. The Orthodox Church is the original Christian Church founded by Jesus and continued by his Apostles. It is the same Church described in the Bible as the ‘Body of Christ’ and the ‘Bride of Christ’ (1 Corinthians 12 : 27; Ephesians 5 : 23–25). Throughout its 2000-year history Orthodox Christianity has remained faithful to the teachings and practices passed on from the Apostles and early Church Fathers (2 Thessalonians 2:15). The Orthodox Church began in Jerusalem in 33 AD on the day of Pentecost (Acts 2), and from there spread throughout the world. Today some 200 million people identify themselves as Orthodox, most of whom live in Greece, Russia, Romania, Serbia and other eastern European countries, as well as throughout the Middle East. Approximately four million Orthodox live in the United States. This ‘Eastern’ Orthodox faith has established itself throughout the world: in North America, Africa, Australia, and Western Europe. Small groups also exist in Asia and South America. Orthodox missionaries from Russia were present in Alaska by the late 1700s, and in Japan and China by the mid-1800s. But the spread of Orthodox peoples throughout the world increased dramatically during the 20th century, particularly in the wake of anti-Christian Communist oppression throughout Eastern Europe. Greek Orthodox or Russian Orthodox ??? Orthodox parishes are often identified according to the language in which services are celebrated or the national identity of parishioners. Thus they have come to be known as ‘Greek Orthodox,’ ‘Russian Orthodox,’ ‘Serbian Orthodox,’ etc. But this can be misleading: there is only one Orthodox Church, and it is not tied to any particular nationality. The Orthodox Church is for everyone, regardless of ethnicity: this is shown by the presence in most Orthodox parishes of many converts from Western Christianity or from non-Christian religious beliefs, and even from the darkness of atheism. The word Orthodox is Greek for ‘right glory’ and refers to the correctness and truth of the Orthodox Church’s faith and worship (cf. John 4 : 23–24). The Orthodox faith is expressed most fully in the Bible, the God-inspired books of the Old and New Testaments. This same faith is expressed very succinctly by the Nicene Creed, composed by theologians who met at the first two (of seven) great Ecumenical Councils held in 325 and 381. This statement, based on the Scriptures, teaches that there is one God in three Persons: the Father, the Son, and the Holy Spirit. God the Son, Jesus Christ became man, was born of the Virgin Mary, suffered and died for our salvation, rose from the dead, and ascended physically to heaven, from whence He will come again at the end of the world to judge the living and the dead. 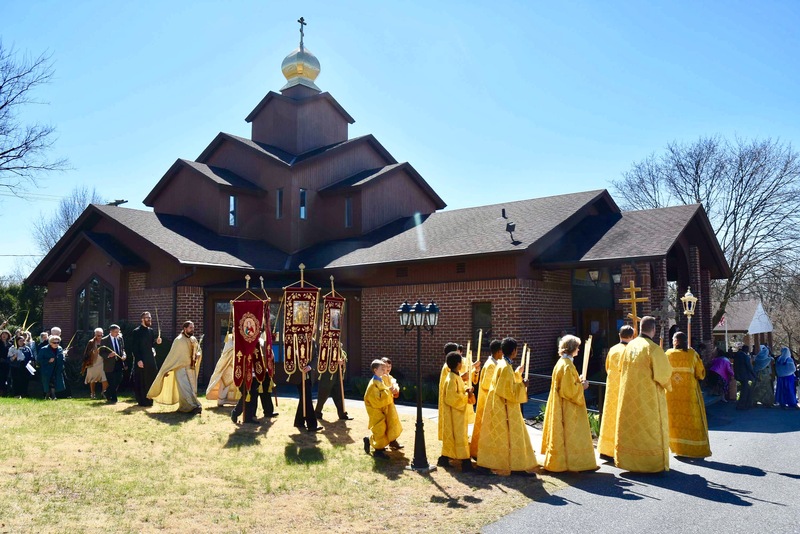 The Divine Liturgy (what Roman Catholics often call the Mass) is the very heart of Orthodox life and faith. In it we receive Holy Communion which unites us with other Orthodox believers throughout the world. We are also united to the whole ‘communion of saints’, all the departed martyrs, holy fathers and mothers of past ages – who join us and the hosts of angels in giving unceasing glory to God (cf. Isaiah 6 : 3; Revelation 7:9–17). But most importantly, Holy Communion unites each of us to Jesus Christ, for he offers himself to us in his very Body and Blood (cf. John 6 : 53–57). Orthodox parishes celebrate the Divine Liturgy every Sunday morning as well as on many feast days throughout the year. The Christian life consists in opening our hearts, minds, and bodies to this merciful grace of God’s healing, and this is a life-long endeavor requiring faith and perseverance. (cf. Philippians 2:12–13) Through constant prayer, through participation in the Church’s sacraments and the study of Holy Scripture, through serious struggle against our strong inclinations to sin and selfishness, and through gestures of loving self-sacrifice for others, we strive to enter more deeply into communion with the God who is Love (1 John 4:16). Union with God constitutes man’s only true and lasting happiness. It is this union and this happiness which Christ Jesus longs to give us, and the Church exists to make that happen.